Twitter / JacobLongTVPassengers exiting Terminal 2 at St. Louis Lambert International Airport. A burnt bagel forced Terminal 2 at St. Louis Lambert International Airport to evacuate on Tuesday night. The evacuation lasted less than 10 minutes and no flights were reportedly delayed. Travellers had to endure a temperature of 11 degrees during the evacuation. 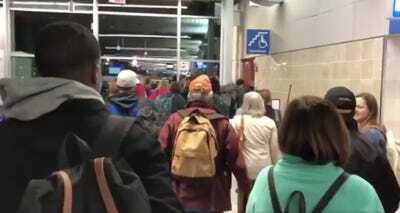 Holiday travel can be a pain, and that was particularly true for the hundreds of travellers who were forced to temporarily exit Terminal 2 at St. Louis Lambert International Airport on Tuesday night, according to the Associated Press. The terminal is occupied by Southwest Airlines. Though the evacuation lasted less than 10 minutes, travellers had to endure an 11-degree temperature outdoors and go through security again upon re-entering the airport. No flights were reportedly delayed. 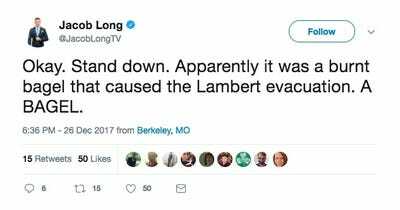 TV anchor Jacob Long captured the evacuation via Twitter, where he postedvideos of confused travellers using the terminal’s emergency exits. The evacuation follows an 11-hour power outage at Atlanta’s Hartsfield-Jackson International Airport on Dec. 17, where over 1,400 flights were canceled over two days.